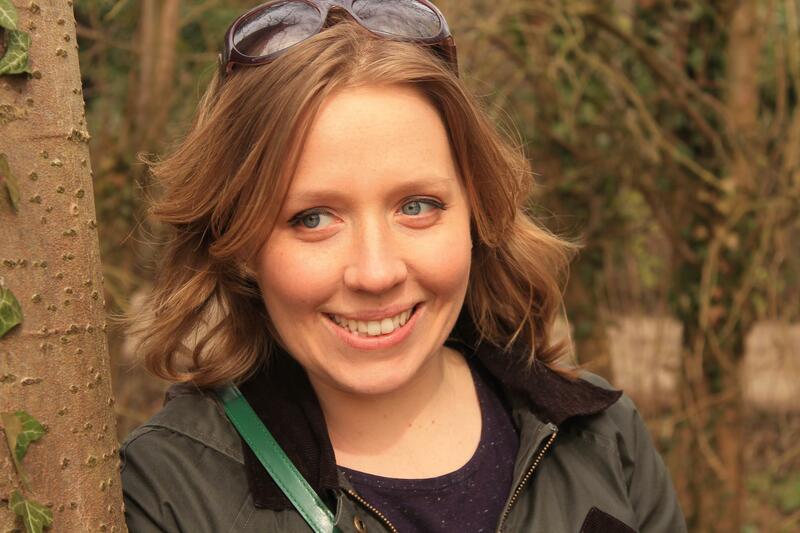 Five years and two maternity leaves after she first left the classroom, Frances Ashton (@FKAEnglish) talks work/life balance and powering through the return to work on your terms. I have always loved September. That crisp autumnal air, the excitement of new challenges and old friends. Even as a child, I was always pleased to return to school, bag packed with new stationery and a spring in my step about what the year would bring. I know that this enthusiasm is not a universal experience: one scroll down my Twitter timeline speaks volumes. I am fortunate however to work in an incredible school, in a fulfilling role and more importantly I feel that I have carved out a sustainable balance between my life in the classroom and my life beyond. The return to work can bring anxiety about how this ‘balance’ can be maintained, none more so than after a period of parental leave in which your entire focus has been on sustaining and enjoying a life beyond work. Five years and two maternity leaves after I first stepped out of the classroom, I have come to realise that the most realistic and sustainable way to live is not to station ‘work’ and ‘life’ as diametric opposites that you are precariously darting between, nourishing at pace, constantly dogged with guilt at ‘neglecting’ the other. Rather, if you love your job and its worth doing, integrating it with your personal life so that both an equally nurtured brings a longer term satisfaction. That’s not to say that there aren’t pressure points and however you look at it a working life can be frenetic. The start of the school year can be particularly loud and immersive and you can feel like you’re on the back foot before you’ve even taken a step forward. For me, organisation is crucial. It is, not to be hyperbolic, the key to my survival. More than that, it is the key to finishing each day content that I have given time and energy to all of the areas of my life. Clearly I do not have a 100% success rate. Some days are off kilter and unsatisfying. But they are fortunately rare. Nothing that I do is groundbreaking. The tips I share below are purely that: tips. But if they help anyone, parents or not, to feel less anxious about the return to work, then great. When I returned to work after my first daughter was born in 2014 I was still breastfeeding her. Despite my best efforts, her stubborn refusal to take a bottle alongside an unforeseen dairy allergy meant that I drove to her nursery each day before it opened to breastfeed her in the car park so I knew that she’d had some before I left her. I would race to do the same at the end of each school day. This continued for 3 months until she was a bit older and was happily drinking the dairy free milk from a cup. But I didn’t tell a single person that I was doing this. Not one. Driving the 5 minutes from nursery to school, I put immense pressure on myself to don a professional mask that hid the sleep deprivation and stress. Years later, upset about having to take my daughter to A&E, I found myself apologising to my Head for ‘being unprofessional’ only for her to tell me with compassion and empathy that ‘there is nothing unprofessional about caring for our children.’ And of course there isn’t. We are not automatons. Life has beauty, sorrow and innumerable complexities and the best schools encourage and support open dialogue about the stress points in the lives of their staff. Talk. Be open. And if they won’t listen, find a school that will. I often say that I can tell what kind of year I am going to have based on the timetable. Those few labelled cells on a spreadsheet are a blueprint for your peaks and troughs, your windows of productivity and your ‘power-through it’ pathways. But your timetable is your friend. Get to know it. Think strategically about what those innocuous boxes mean for you. How you can be most effective. Last year Tuesdays were the ultimate ‘power-through.’ Alongside a 5 period day, I also had a lunch duty and a long after school SLT meeting. There was absolutely nothing I could tick off my ‘to-do’ list on a Tuesday. Nothing. I did, however, have two frees on a Monday. Frees I would protect with my life and carefully link to lesson prep and whittling down my to-do list. Avoiding low impact tasks in these frees made sure I felt less stressed on Tuesday. Each week, I print out a ‘weekly planner’ version of my timetable and will in what I am teaching and what I am going to work on when. I can then use this to transfer into my diary (see below) Thinking ‘big picture’ before feeling swamped in the minutiae really helps self evaluation. Last year was the first year in a decade that I rescinded the offer of a teacher’s planner. I needed something that allowed me to integrate all of the different pressures and demands on my life and the bullet journal approach has been a godsend. 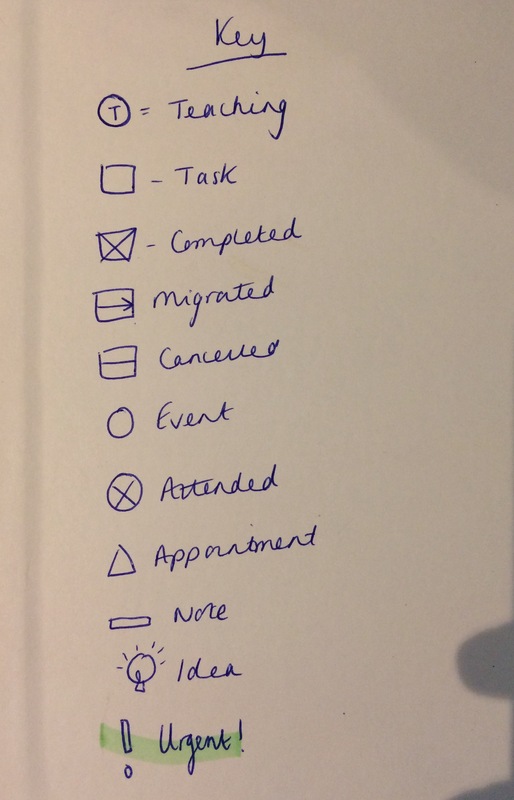 I am by no means evangelical about the process, but I’ve adapted the main ideas to suit me and have found that it has helped me plan my time, hold myself accountable and avoid the goading pressures of one stagnating ‘to-do list.’ In brief, all you need is a ‘day a page’ planner and your own coding system (mine is below) I outline what I am teaching at the top and then list events, tasks and reminders underneath, carefully crossing when complete or drawing a line through if cancelled. Two significant features are the migration function (an arrow and adjacent date) which codes for a task that has not been completed and has been moved to a different available slot. I found that this helped me evaluate my list regularly. If I haven’t achieved it, is there a reason? Do I need some more time? Am I being too ambitious. Equally, the urgent exclamation mark is my non-negotiable. This means I have to complete it today and this helps focus the mind. It might not be the most glamorous task, but I needs to be done. In the example below it is important to note that I have included a phone call I needed to make about my daughter. Life, work integration in black and white. The above ideas are just three ways to help the return to work. 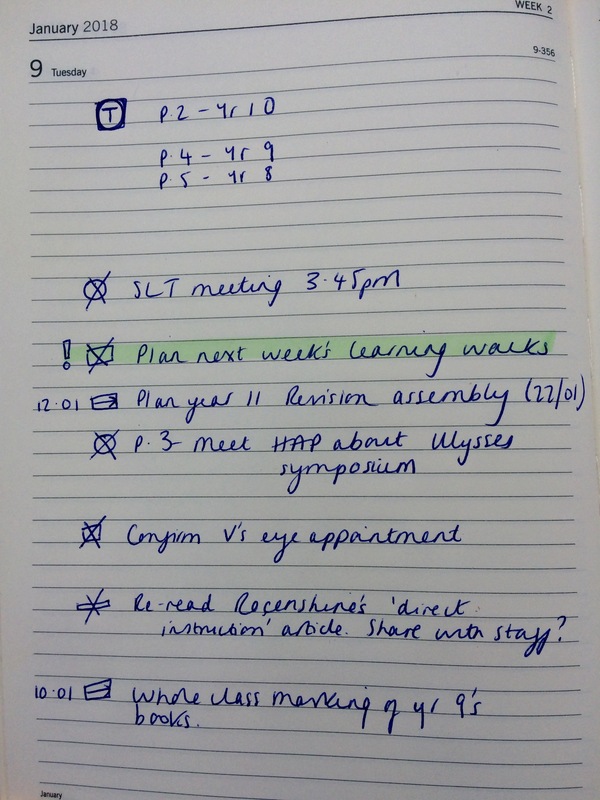 I have written before about ways to streamline workload and all of these ideas can be used alongside the above. I hope they are helpful! Regardless, it is important to let yourself feel the emotion of the transition. Empathetic schools understand it and support it. Good luck!